Since my daughter started doing hippotherapy (therapeutic riding) this past summer, she has a new found friendship with each horse she rides. 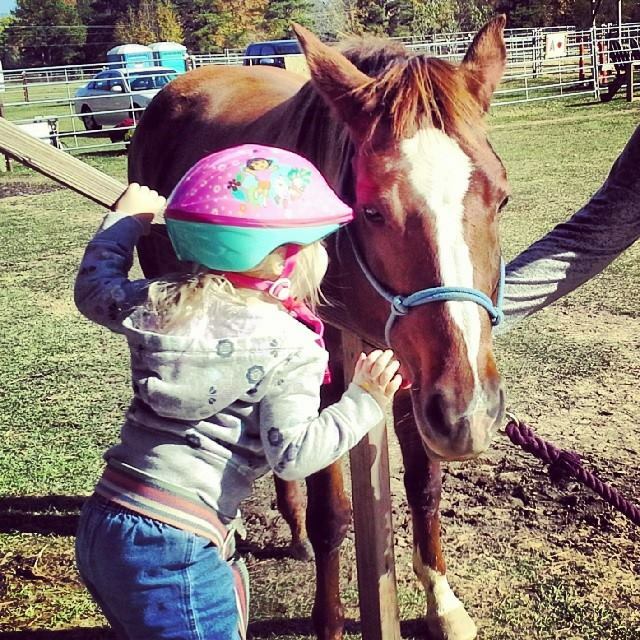 Though in the picture she is seen leaning in to kiss a horse named Peaches, she usually rides another horse named Gilly. Hippotherapy has helped her open up more with her confidence in horses and most other animals, as well as helped her open up with her speech. Up until the age of three she had barely an eight word vocabulary, whereas most kids that age has three times that many words in their vocabulary. Hippotherapy helps keep her calm and relaxed to the point where she can use that energy to focus on other things, such as seeing the world around her and telling us about what she sees. When she isn’t riding, she is mostly focused on one thing and has to have help in redirecting her attention to something else. Now that she is four years old, she has started talking more and is using actual sentences. She still babbles a lot, but it is the effort in trying to say what she has to say that counts. This entry was posted in Autism, Blog, My daughter, Photo Challenge and tagged animals, Autism, Autism awareness, autistic children, beginning, children and horses, children with autism, children with special needs, growing up autistic, Harmony in Hooves, hippotherapy, horses, love, occupational therapy, photo-challenge, physical therapy, single mom, single parents, Special needs, special needs horses, speech therapy, therapeutic riding, therapy riding, Weekly Photo Challenge on January 3, 2014 by JenniferNAdams. That is so cool that you daughter is riding. There is a youth who calls our service who is also riding as her therapy. Blessings and thank you for following my blog. You have a very interesting blog here as well! Thank you for following! I find that horses are great for therapy for everyone. She finds is calming and enjoys it. Yes, I am learning so much from people who enjoy this therapy. Thank you for sharing.